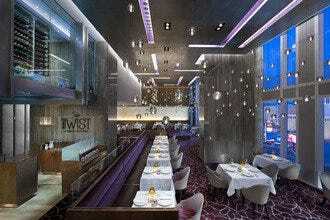 Where you have lunch in Las Vegas really depends on what you’re doing during the day. If you’re out sightseeing and wandering along the Strip, a casual, reasonably priced place is probably what you’re looking for. Those who want more upscale offerings won’t have to look far, either. 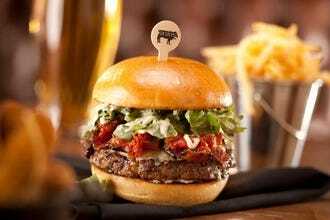 Lunch often makes people think of hamburgers, and Las Vegas has every kind of burger restaurant you can think of, plus a few. In addition to most well-known chains, you can also find places like Bobby’s Burger Palace, Chef Bobby Flay’s burger joint. The decor here is totally 1970s, in a fun way, and the burgers are everything you’d expect from Chef Flay. At more upscale Strip restaurants, diners will find lunch specials that can make an otherwise spendy restaurant more affordable. For any restaurants that are on your “must visit” list, it’s worth checking ahead to see what’s on the lunch menu. Often you’ll find less of a crowd during lunch as well, but some restaurants recommend reservations no matter what the time of time. Mon Ami Gabi, for example, is one of the busiest restaurants on the Strip. 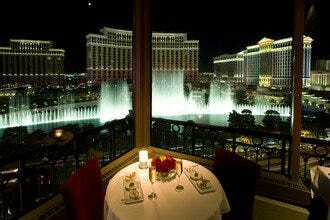 Its patio overlooks the Strip and the Fountains of Bellagio, making seats here highly coveted. Lunch here can be a real experience, between the wonderful French food and the people watching opportunities. Reservations are a good idea, even for lunch, as at other busy Strip restaurants. 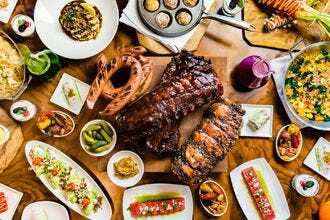 Whether you're hungry for opulent lunch or just a casual nosh, our list of the Strip's 10 best lunch spots will help the right spot. 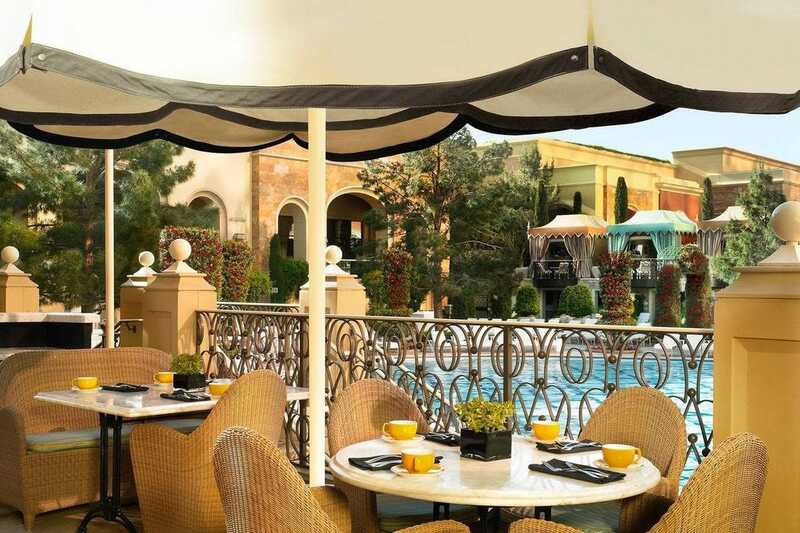 With a terrific view of the pool at Wynn Las Vegas, the Terrace Pointe Cafe at Wynn offers breakfast and lunch diners something beautiful to look at and a good selection of dishes. The menu here is modestly sized, but filled with solid breakfast and lunch standards, like Eggs Benedict, omelettes, sandwiches and burgers. Entrees include succulent dishes like the Pan Seared Pink Snapper, Blacked Fish Tacos or Filet Medallions with crushed fingerling potatoes, roasted oyster mushrooms and green peppercorn sauce. Vegetarian, vegan and allergen menus are also offered. 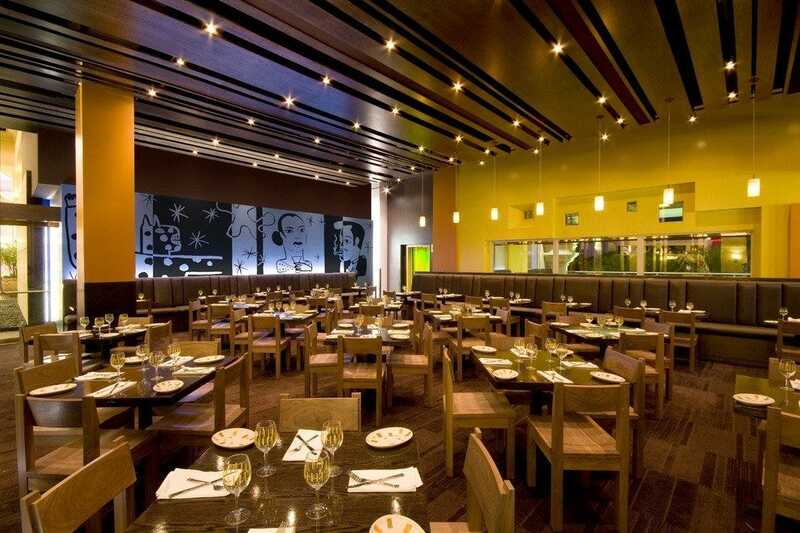 Indoor and outdoor seating is available, and a sophisticated atmosphere is present no matter which section you choose. Terrace Pointe makes a nice, upscale alternative to the buffet. 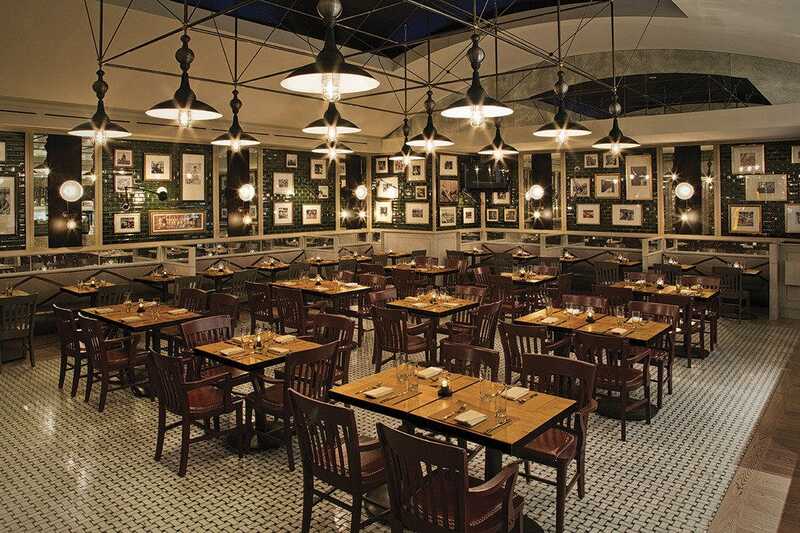 Holsteins fits perfectly into the atmosphere at the fun, quirky and elegant Cosmopolitan of Las Vegas. As befits any Strip restaurant, the cocktail menu is exhaustive, and includes a selection of alcohol-infused shakes--"Bam-Boozled Shakes"--as well as an extensive drink menu that covers everything from cocktails to Dom Perignon Champagne. 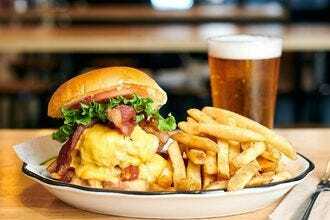 The beer selection is impressive, giving diners plenty of options that pair perfectly with the restaurant's selection of burgers, salads and other dishes. The menu notes which brew pairs best with your burger, salad or appetizer. For traditional burger fans, The Classic is exactly what it sounds like--lettuce, tomatoes, onion, pickles, ketchup and mayo. But if you'd like something different, you'll find plenty of options like the Al Pastor Burger, with al pastor pork in addition to a beef patty, habanero cream, red onion, grilled pineapple and avocado. Toppings, buns, and condiments are all created in-house. The retro design at Bobby's Burger Palace gives Chef Bobby Flay's burger joint a little bit of a 70s feeling, but the burgers are thoroughly modern. Take your pick of certified Angus beef, ground turkey or whole chicken breast and put it with one of restaurant's signature burger builds, like the classic Crunchburger with American cheese and potato chips, or get adventurous with one of the other choices, like the Dallas, with coleslaw, Monterey Jack cheese, pickles and BBQ sauce. Sides includes several types of fries and onion rings as well as salads. Since no burger restaurant would be complete without milkshakes, Bobby's Burger Palace offers a selection of the creamy treats. Guests over 21 can spike theirs with a shot of vanilla-caramel bourbon, pineapple-coconut rum or mocha-Kahlua vodka. The Bobby's Burger Palace on the Strip is the only location so far on the West Coast. The Grand Lux Cafe is a sister to The Cheescake Factory, and the family resemblance is most apparent in the size of the menu. The tremendous number of mouth-watering choices can make it tough to decide what to have, and the comfortable, relaxed setting is a great choice for casual meals. Come for pastries and omelets in the morning, and enjoy selections from either the lunch or dinner menu from 11 a.m. through the rest of the evening. Choose from nine types of hamburgers (plus veggie and turkey burgers), an array of sandwiches, plus pastas, steaks and appetizers that can stand alone as a small meal. 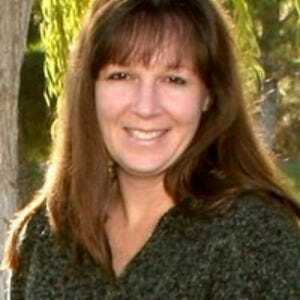 You'll also find coffee drinks, plenty of cheesecake, and friendly service. Both The Palazzo and The Venetian have Grand Lux Cafe restaurants, but the Venetian location is open 24 hours while The Palazzo's is open from breakfast until 2 a.m. This famed Italian-American steakhouse, known for its prime aged steaks and jumbo Nova Scotia lobsters, offers a well-rounded lunch menu that's certain to please everyone at your table. 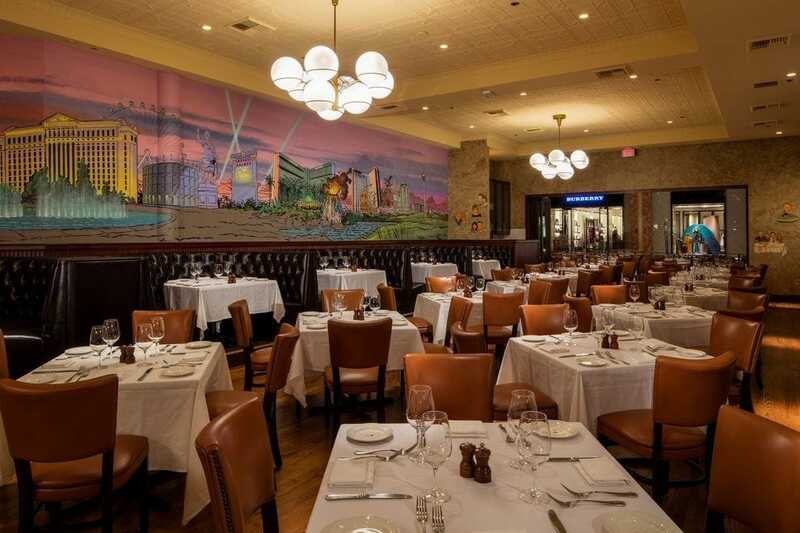 Guests can dine on the indoor patio and watch shoppers pass by or eat inside the main dining room, famous for its many caricatures on the walls. The lunch menu is notably more affordable than the dinner choices, with both à la carte options, like the Nova Scotia Lobster BLT Sandwich, as well as the "Power Lunch" option with two courses and a side. 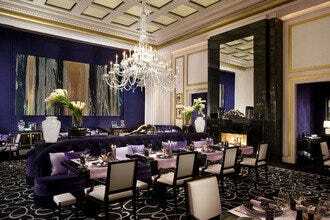 Lunch is a great way to experience The Palm's powerhouse menu for much less than the dinner price. One of Las Vegas' best Mexican restaurants, boasting two floors of patio dining overlooking Mandalay Beach, Border Grill serves a wide range of modern Mexican dishes. Tempting options include ceviche, tacos and enchiladas. The Brisket Taquitos are especially tasty. For heartier fare, an entree might be your best bet. Choose from Yucatan Pork, grilled skirt steak, chile relleno or Asado Norteno Chicken. No meal here would be complete without a Margarita, and luckily you have a few to choose from, although the Cadillac Margarita is both a simple preparation (no sweet and sour mix here) as well as dangerously yummy. Vegan and gluten free dishes are available and are noted on the menu. Tucked away on the 3rd floor of Nordstrom at the Fashion Show Mall, the Marketplace Cafe is something of a hidden gem on the Las Vegas Strip. 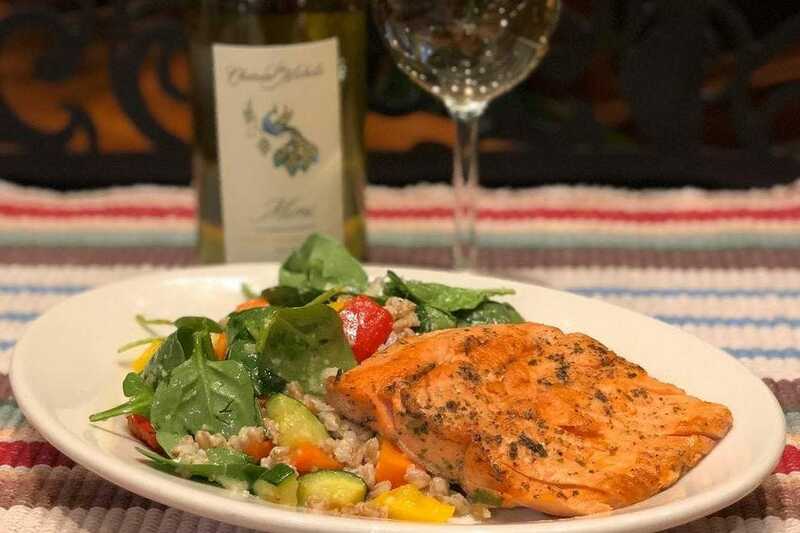 The menu offers a solid selection of lunch or dinner dishes, like wild salmon or grilled skirt steak, as well as more casual and light selections. 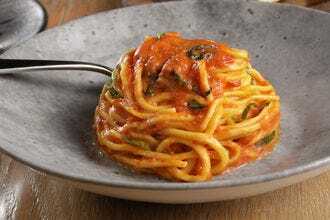 Soup, salads, pasta, pizza and sandwiches give guests a well-rounded array of dishes to choose from. Service is reminiscent of cafeteria style since you place your order at a counter, but servers bring your order to your table. The peaceful setting at Marketplace is a nice break from the hustle and bustle on the Strip, and the prices are less than you'll find at many restaurants in the area. 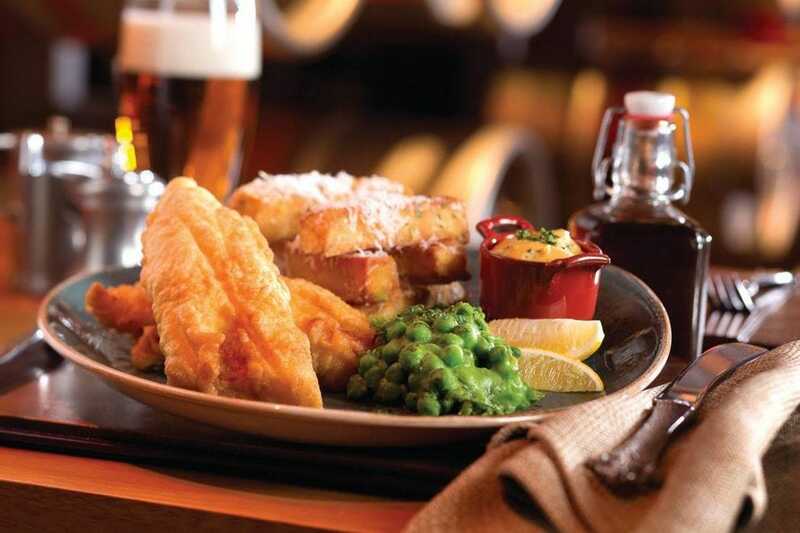 The casual Gordon Ramsay Fish & Chips is one of several restaurants along the Linq Promenade, and it features traditional British food from well-known Chef Ramsay. The small, take-out style eatery has a simple menu featuring fish and chips, as you'd expect. Sausage, shrimp and chicken are also offered and domestic and imported beer is available. As you're walking through the Promenade, it's easy to spot the restaurant, with its red doors and distinctly British appearance. It's also hard to miss the large wooden fish painted with a Union Jack on the sign. Service is quick and efficient, although there's not a lot of seating. If you can, grab a seat on the patio and do some people watching while you eat. The comfortable, easy-going atmosphere at Citizens Kitchen and Bar invites you to sit down and enjoy a tasty lunch with friends. The comfort food here comes in big portions, and it's as flavorful as it is big. 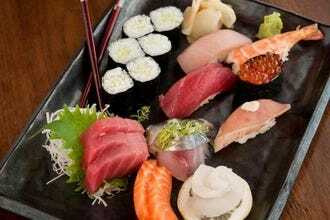 For lunch, smaller appetites may want to stick with appetizers like the tempura shrimp or chicken fingers. Several kinds of salads are also offered and guests can add chicken, salmon, steak or shrimp to any of them. 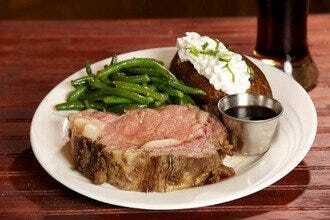 Citizens is known for its French onion soup, as well as its meatloaf, both of which epitomize the "comfort food" theme. Sandwiches come with a side of French fries, macaroni salad or coleslaw and include favorites like a delicious French Dip, made from thinly sliced prime rib. Burgers and all-day breakfast are also served. Full bar service is available as well. 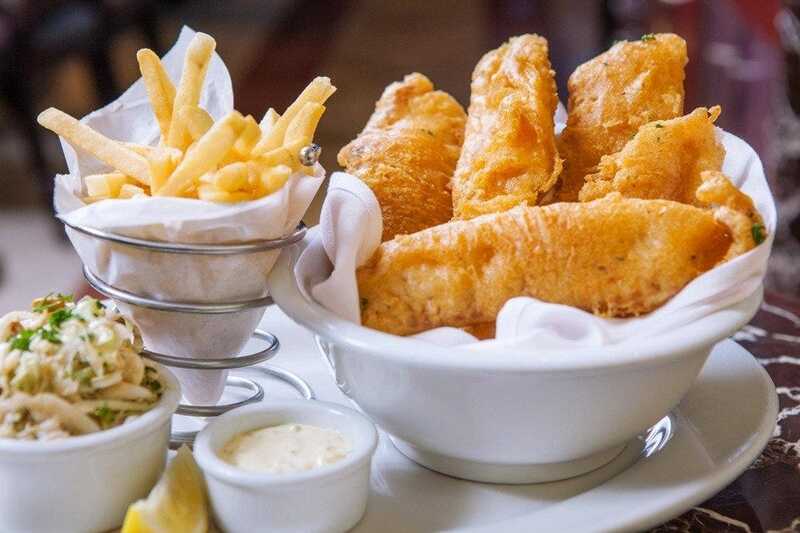 One of the Strip's most memorable dining experiences at any time of day, Mon Ami Gabi is open for breakfast, lunch, dinner and a weekend brunch. 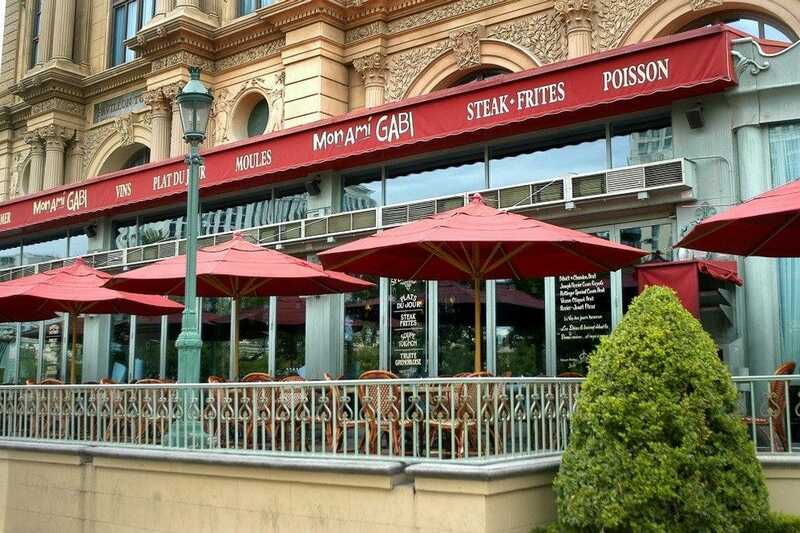 Known for its Strip-front patio facing the Fountains of Bellagio, the classic French bistro boasts one of the best people-watching spots in town. Lunchtime favorites include the restaurant's trademark Steak Frites, the Onion Soup au Gratin with bubbling baked Gruyere and the heavenly Baked Goat Cheese. Guests will also find a gluten free menu and a kids menu. To complement the cuisine, an extensive selection of more than 80 boutique French wine varietals--handpicked by Gabino Sotelino himself--are served by the glass or bottle from the restaurant's signature rolling wine cart.